All images by Brendan Finn. Designed by Bent Architecture, this project involves the transformation of a typically mundane and static office warehouse building into the dynamic new headquarters for Melrose, a national health product company based in outer-eastern Melbourne. 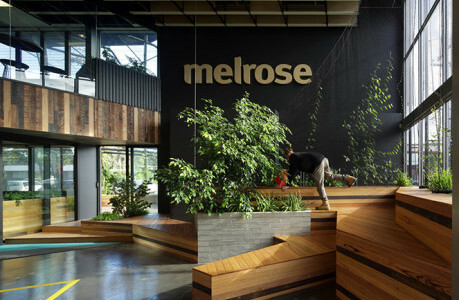 It embraces the Melrose ideology of whole body health by creating a workplace that is responsive to the natural environment and engaged with the processes within. The street façade of the existing two storey office block was eroded via the introduction of an organic tubular steel structure that literally connects the site’s landscape to the building fabric. Part sun-shade and part landscape arbor, the structure supports a combination of deciduous and evergreen vines that liberate the existing north facing windows that would otherwise cower from hot summer sun, and provides a conduit for greenery to permeate the office interior. 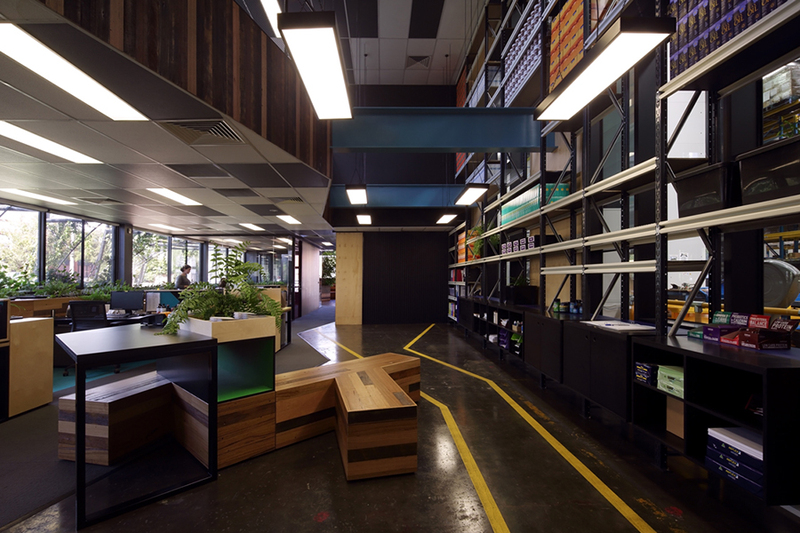 Openable windows were inserted to facilitate natural ventilation, and modular garden beds and joinery components comprising recycled materials and building off-cuts were inserted to define workstations, co-working areas, quiet spaces and collaborative ‘landscaped’ breakout zones. 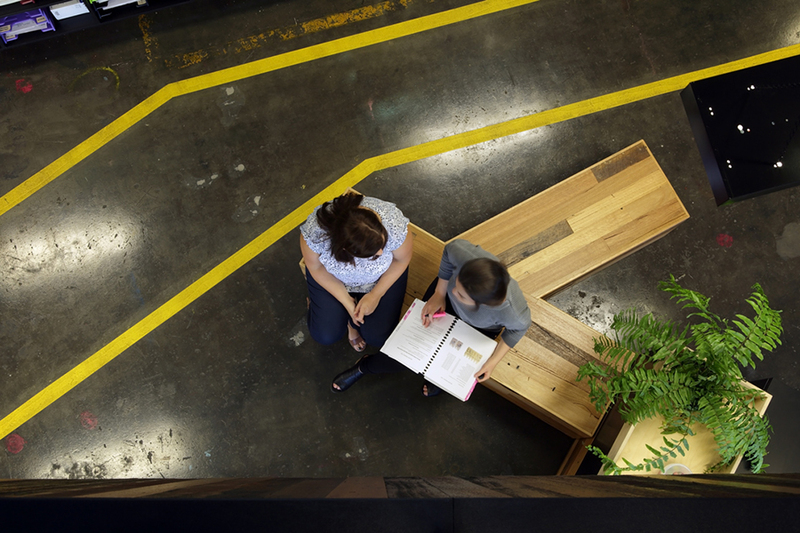 Existing ceiling tiles were retained and repainted and the original warehouse concrete floor was exposed; a section of floor on the upper level was removed to provide a transparency and connectivity between levels, further enlivening the workplace. The division between office and warehouse was also eroded, with full height openings inserted to provide a more immediate connection between the various operations of the company. 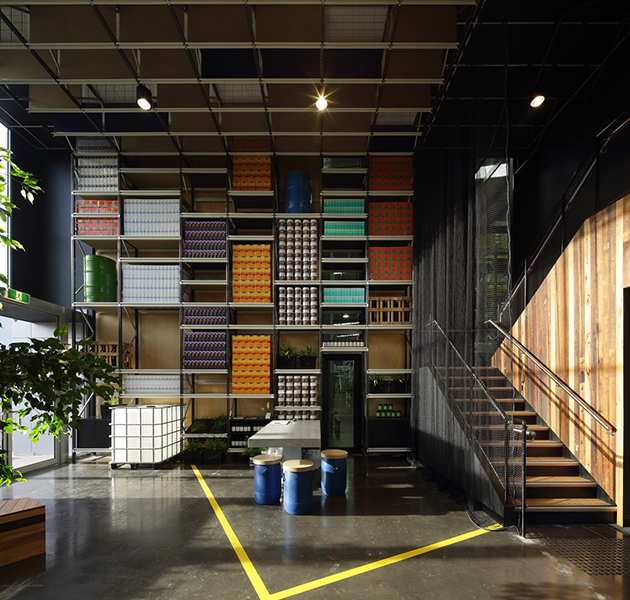 Warehouse palette racking permeates the interior to strengthen the link between the two zones and, in addition to storage and stationary typical of an administrative space, supports additional planter boxes and showcases the Melrose product range. The racking and merchandise extend dramatically into the company’s foyer, which is a light-filled double height entrance hall that is programmatically and spatially diverse. 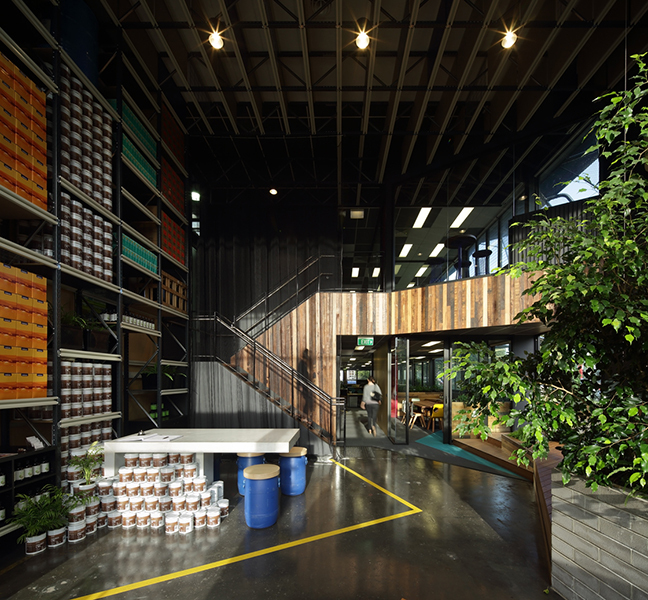 The original warehouse floor within this forecourt was once again exposed, and timber lined terraces, a centrally located weeping fig, climbing vines and natural sunlight define a space that, on entry, embodies the ethos of the company, the products it creates and the benefits of harnessing nature to promote good health.